Preview of emails with attachments residing in the MBX file. Automatic detection of MBOX file belonging to a particular client. Provision to export selective mails/ folders from MBX to PST file. MS Outlook installation not necessary for conversion of MBX. Open Recent Collection : Open up the previously created collection. Click on Scan file button located at navigation bar. Select the source file as MBX from the list. Then to browse the file from local choose the modes & click on ADD button. Bulk Mode :- To Browse the folder containing the Multiple MBX files. Find Option :- It allows you to automatic locate the MBX file from storage drives. The MBX to PST Converter starts scanning file with email count. Select the emails which you to convert mbx to eml. For exporting bulk emails, select the export option from the navigation bar. I have recently upgraded the operating system from the previous version of windows 8.1. I had successfully restore my important software from the drive and installed it again but when I install the email client, it works fine for some days but after it was not started I uninstall and the reinstall it, it shows error in accessing the database and goes down suddenly. I did have such kind of errors in the last system. I totally fed up and can not bear with this anymore. So I decided to go with other email client having tremendous features and have multiple support base with my complete set of data about 15000 Emails. Can I Convert Bulk MBX Emails to PST? Does software auto locate MBX file from storage? Does the folder sequence remain same after conversion also? Is Metadata information sustains by the software? Does software recover delete MBX emails? The conversion of one email file to other is the very tedious process. One has been more cautious while converting data from one file to other. There is the possibility of corruption of data. But you do not need to be panic because MBX to PST Converter tool is capable enough to tackle your problem instantly. It is equipped with high-quality technical features. 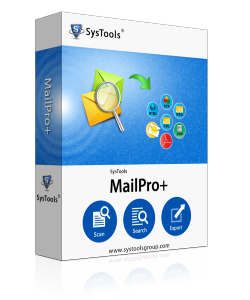 It converts bulk MBX emails to PST. With the help of find option, it can auto-locate the MBX files from the local system. It maintains the folder hierarchy and also preserves metadata information of MBX data after the conversion also. MBX to PST Converter is capable enough to recover the deleted emails form the MBX database file. Does the tool support conversion of the embedded attachments? Yes, MBX To PST Converter is designed to convert all the emails with their respective attachments to PST format. Does the software support conversion of corrupted MBX files? Is Outlook installation necessary for the conversion? Yes, it is necessary to install MS outlook for performing the conversion. No matter what all methods I tried, I was not able to convert the MBX file to PST format. 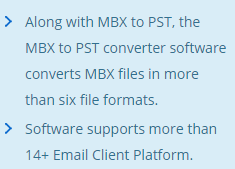 Then I came across MBX To PST Converter which does the conversion in a matter of time. I am really glad that I purchased this tool. Eudora was the desktop email client supported on both Mac & windows operating system. But Eudora email has updated its format for saving the file in the back-end to MBOX file format since July 2010. MBX file format was outdated file format. So If the user desired to upgrade to Outlook because outlook has been more secure and reliable email client. For this, you have to convert MBX file to PST so as to migrate Eudora to Outlook. MBX to PST converter performs the same in convenient way by preserving metadata and sustains the original data structure .